Many of you know from my previous posts that I am currently working really, really hard to lose weight. It hasn’t been easy, but I am looking forward to being healthy and shopping in my closet again. One of the hardest parts about loosing weight is eating healthy. Since I love desserts, it has been really hard satisfying my sweet tooth lately. 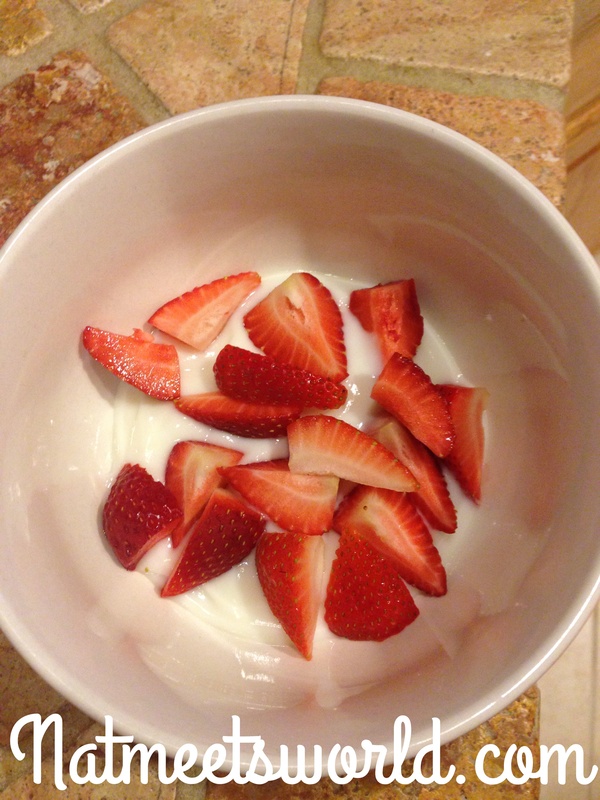 Tonight, I decided to make a healthy yogurt parfait to stop those pesky sweet cravings. I have seen others use granola in their parfaits for that light ‘crunch’ that hits the spot. When I looked for granola at the grocery store I was truly shocked not only at the caloric intake, but at the grams of fat content! Granola can be very, very fattening and while it may not be a big deal to others, it is to someone who is counting every calorie. I decided to try something off the top of my head with a lot less calories and a whole lotta’ crunch! I must say, it came out great, and I was truly satisfied after eating it. I usually would include a banana in this parfait, but I ate one earlier in the day and didn’t want to eat another. Keep in mind that you can use your own favorite choice of fruit for your parfait, not just strawberries. Some love bugs like the parfaits to be mostly fruit with a small amount of yogurt, and some like more yogurt than fruit, but I felt my recipe had a nice combination of the two. 1. 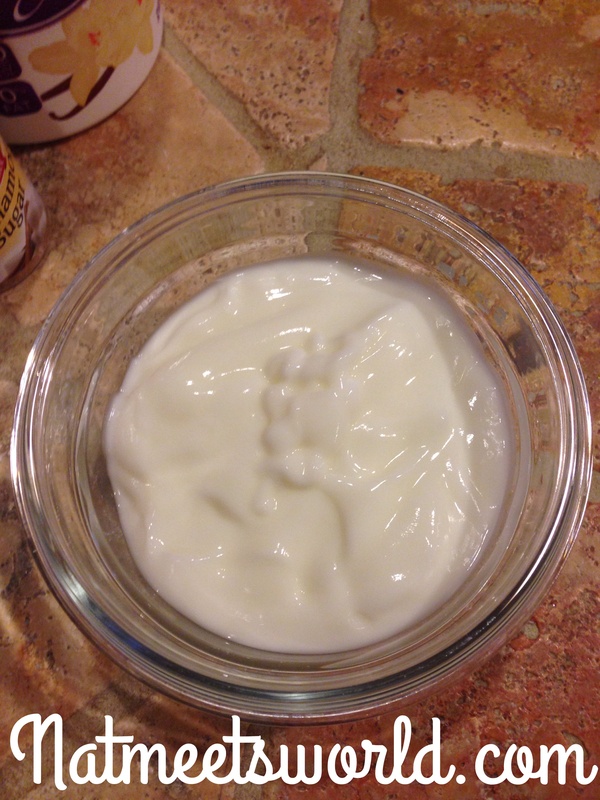 Measure out 3/4 cup of yogurt and scoop it into a bowl (below). 2. Next, rinse and cut your fruit into bite sized pieces. Sprinkle over the yogurt (see below). 3. 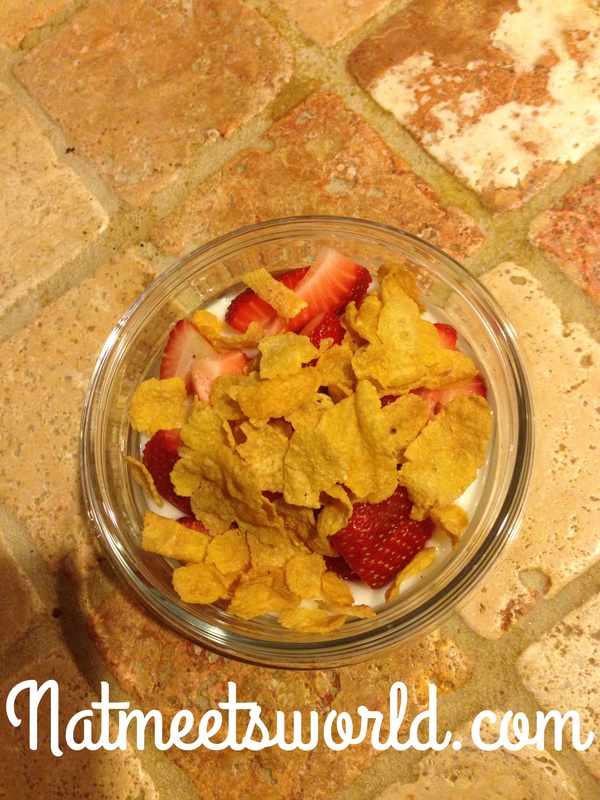 Since I am using corn flakes instead of granola, I needed to make sure I added some sweet flavor to the crunch. 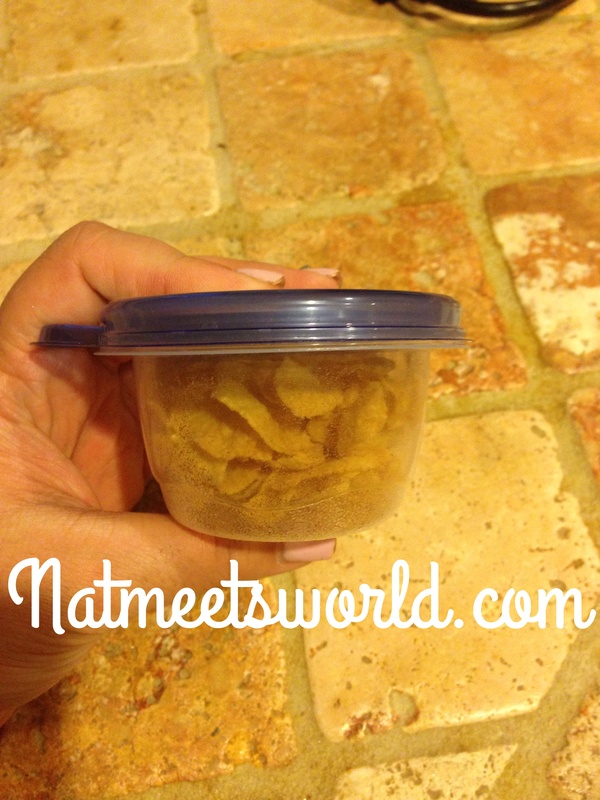 I used a great little 1/2 cup tupperware container to scoop out 1/2 cup of corn flakes. 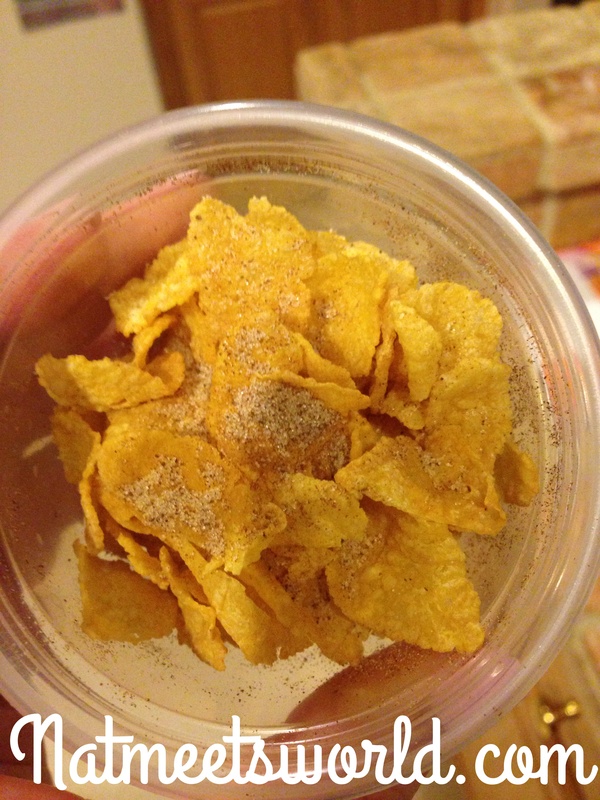 I then sprinkled a dash of cinnamon sugar on top and covered the container with the lid (first picture below). 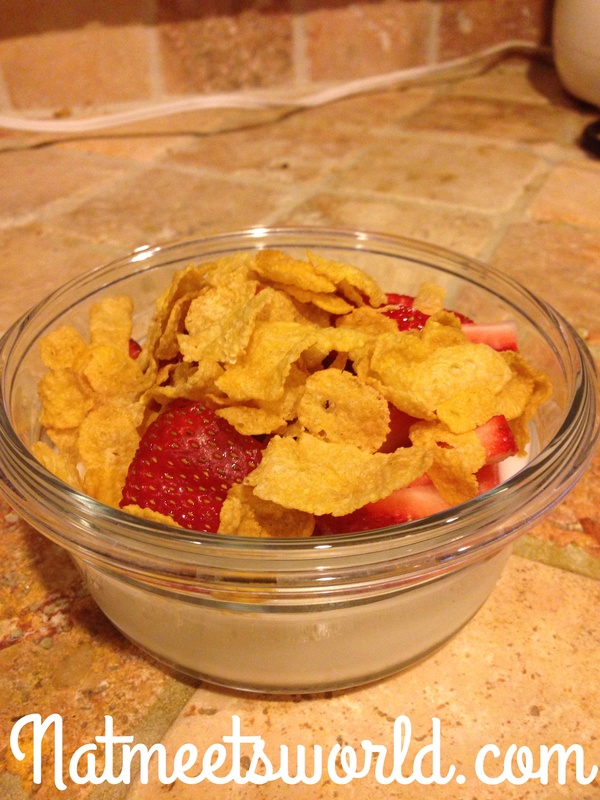 After a few shakes, I lifted the lid and sprinkled the corn flake mixture on top of the parfait. If you don’t have a small container to mix, don’t worry! 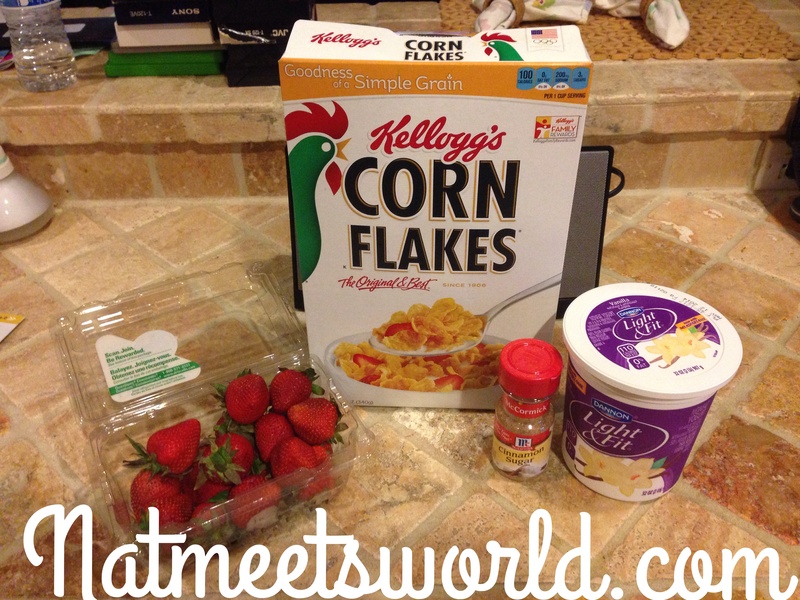 Simply sprinkle the corn flakes on top of the strawberries and dust it with a dash of the cinnamon sugar. 4. You are now ready to indulge in a sweet yet healthy treat that your taste buds will enjoy, and so will the scale! I always store these in containers so that I can eat them for lunch at work, however, you can use already proportioned yogurt cups instead of scooping it out of the large container. I prefer the large container because you get more bang for your buck, and they are usually always on sale. Enjoy your parfait, and let me know what you think! Disclosure: All images and opinions are my own. I created the recipe on my own as well.